The birth of Jesus Christ of Nazareth has split history in two so that each calendar is reckoned before or after His birth. The year in which He was born marks the period known as Anno Domini (literally ‘the year of the Lord’), and the years before that as BC ('Before Christ'). Of course political correctness has substituted AD with CE (Common Era) and BC with BCE (Before Common Era) for fear that any reference to Christ or to the Lord (certainly referring to the former) would offend the sensitivities of non-Christians. Yes, the abbreviations may have changed, but one cannot turn one’s back on the essential reason for the dating. Whether you use Common Era or Anno Domini, the date is actually still the same and the reference point is still the birth of Christ. Call it by whatever name, the Nativity of Christ still provides us with the defining moment of human history – all history before leads to it and all history thereafter is measured by it. “O, wondrous, awesome and salvific mystery!” as the ancient Fathers of the Church would sing. The Word was made flesh; that is, the Son of God, co-eternal with God the Father and with the Holy Spirit, became human. The One Who had no beginning took on a beginning according to humanity; the One without flesh assumed flesh. God became man – without ceasing to be God. The Unapproachable One became approachable to all, in the aspect of an humble servant. 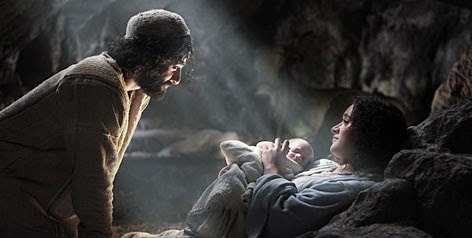 But Christmas is not only his birth, it must also be our birth from God with him. The Word became flesh in order to make us earthly beings into heavenly ones, in order to make sinners into saints; in order to raise us up from corruption into incorruption, from earth to heaven; from enslavement to sin and the devil – into the glorious freedom of children of God; from death – into immortality, in order to make us sons of God and to seat us together with Him upon the Throne as His royal children. The wall that separated heaven and earth is destroyed; the sword that barred the way to the tree of life disappears. That is why we Christians measure history from this date. This is the reason why the world, even for those who continue to shun the use of the abbreviations BC and AD, continue to mark time according to this event. Today we are witnessing a prevalent culture that is generally hostile to religion, a culture that tries its best to remove any trace of Christianity from world history or even Christ from Christmas. The whole push has gotten so ridiculous that it's pathetic. It doesn’t help when we Christians seem to be willing participants of this exercise by acquiescing and even becoming initiators and collaborators of a culture that has forgotten that Christmas is about Christ. Just noticed our greetings – “Seasons Greetings,” “Happy Holidays,” and the content of our carols which seem to glorify reindeers, that iconic jolly elf that promises a Christmas bonus for being nice, and dreamy allusions to wintery weather that seems so out of place with our all-year-round tropical weather. All these are often placed on equal footing with the event of the Nativity, if not given more air time. In today’s world there are many, including those who have been baptised into the Catholic faith, who are seeking to see where God belongs in their lives. For many, God is just an addendum. For others, He has already been expunged from their lives. But yet, there is a mysterious steering within the core of their being, often unnoticed and very seldom understood. This search is often translated into a search for identity, a search for meaning. Perhaps, they seek to understand and rekindle the faith that they have inherited. The starting point of their search for adult faith is all too often still the abstract God of ideas and ideologies and the theological formulae of their youth. But until we know God in a concrete way, we will never know who we are, that’s because we are made in the image and likeness of God. We need to know God. We need to have a very personal relationship with God. God sent His Son to be born of the Blessed Virgin Mary, born in Bethlehem, so that we should know him, not just as an idea but as a real person. So that we can see in human form what he is like. And knowing what he is like, we can shrug off whatever thoughts we may have of God. Jesus shows us the face of God – his unconditional love, a love that was translated by the greatest sacrifice ever made on the Cross. God wants every soul to know him, not vaguely, not just as an undefined mysterious bazaar instinct of the heart, but to know him for who he is. That’s why he gave us Christ. To know God, we must know Christ. That is why Christmas is not an accident. Jesus chose to be born in those circumstances to show us who God is. The Christian God is not a distant much less an absent God, but a God who is present in history but who cares for and directs history. Jesus is not an idea or an ideology but a person, a person who reaches out to us and whom we can encounter in prayer. The loving kindness of our God has appeared in the person of Jesus Christ. On him we build our trust. The time may come, the time should come when someone ask of you “You believe in God, tell me what is God like?” amidst so many ideas, I hope that you have an answer to that question. And if you haven’t here it is – Christ is God – it is Jesus. Jesus is the Lord God. Our culture needs to know who the Lord God is. Christ himself now sends us you and I to let our society know – this is the face of God – we have seen him in the mystery of the Church, we encounter him in the living word of scriptures, we have experienced him in the depths of our spiritual experience, and we celebrate His birth today. Today, if you have come here feeling a little out of place, if you feel a little distant from the Church, a little alienated from your faith. Come and receive the greatest gift God has given you – it is Christ Jesus. And you in turn can also give this gift to others. You have already received that gift at your baptism. Perhaps, it’s been put away in the broom closet, or looks a little rusty from lack of use, but know for sure that the seed of faith, this great gift of God has already been planted in your hearts and your souls. It is a great treasure just waiting to be discovered and to be harvested. May God strengthen your faith today so that you may become His joyous and courageous witnesses in the world and proclaim once again, not just on Christmas Day, but everyday, that Jesus is Lord. He is God! For in Christ, our history has been entwined with eternity!